Where better to spend Christmas Day than Banff’s Sunshine Village? Leave the gift giving and turkey tasting until later, there was snow to be skied! 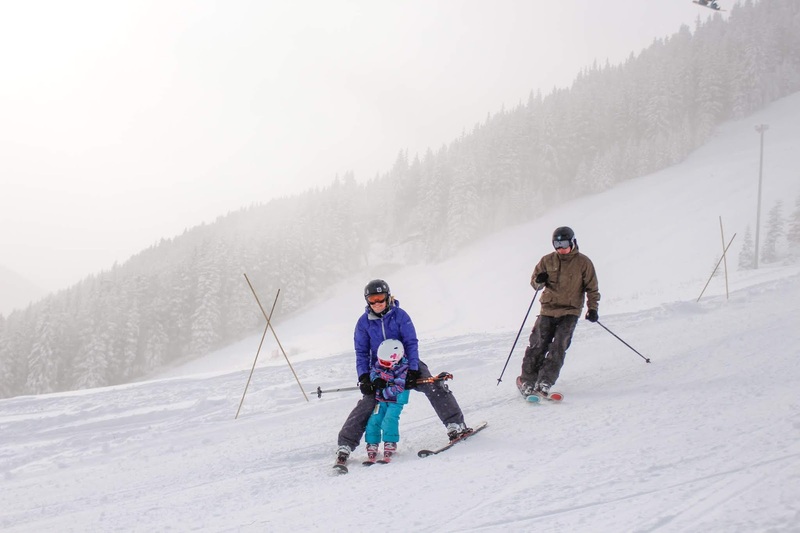 It’s not typically a busy day on the Alberta slopes, just tourists as locals are following family traditions. 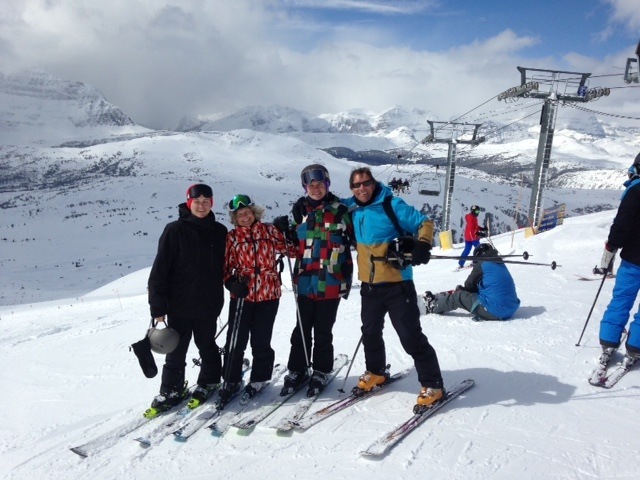 But our family fave is to ski all day, taking a break for a leisurely lunch. After skiing, we race back home to do present exchanges and Christmas dinner in the evening, all energized and exhilarated from a wonderful downhill day. Lunch at the Sunshine Mountain Lodge was a highlight, especially with the menu including diet-damaging bison burgers and sweet potato fries. We sat in the revamped bar of the main Chimney Corner Lounge, where a new wine room made it feel much ritzier than the previous sports bar image. Bit incongruous, though, in our suits and boots! On the hill, we made sure to ski the trail map, doing every chairlift so that we thoroughly skied the terrain. It’s something we used to do when the kids were young to stop them getting bored with our favourite runs – make a game of notching up each lift at least once. Of course, nowadays, all of us favour the heated and covered Orange Bubble which accesses some of Sunshine’s best blacks. 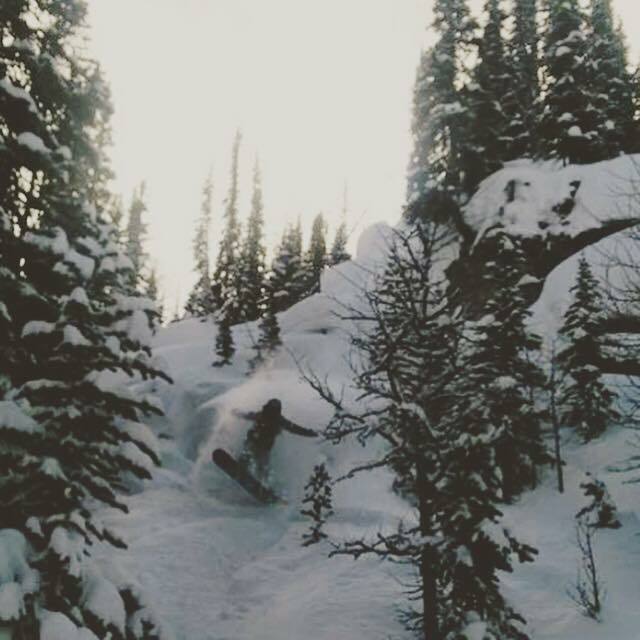 It was at Sunshine that I activated my Mountain Collective pass for the season. As it is a season pass, you don’t line up at the regular windows for this – instead you go upstairs above Creekside to get your photo taken. BTW: on a busy weekend, Creekside is a great place to escape the crowds for lunch. 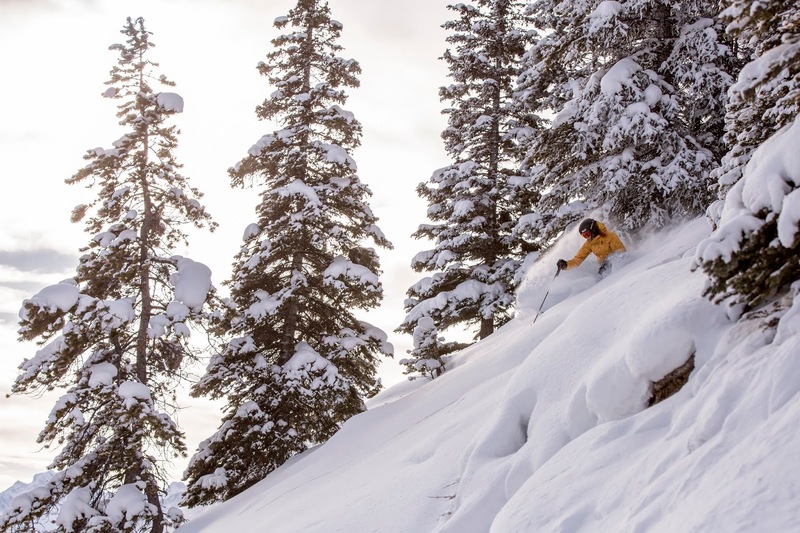 The Mountain Collective pass gives you two days at Sunshine, and the same at all the other 17 resorts it covers, plus discounts on subsequent tickets. 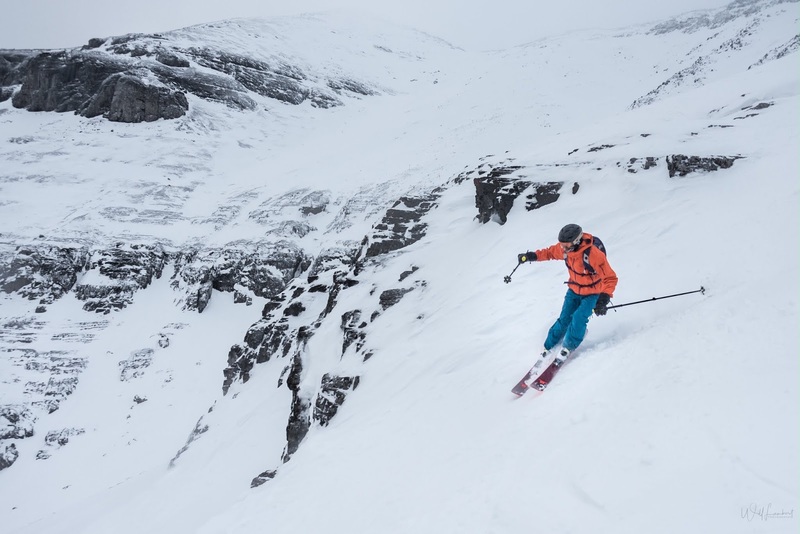 Great for those who are roving skiers, notching up multiple mountains throughout the season. You might bump into SkiBig3 Ambassador, Sue Shih who rides regularly at Sunshine throughout the seven-month winter – Nov to May. Her persuasive posts and photos are reaching 2183 Facebook friends and 1663 wintersports fans on Instagram. 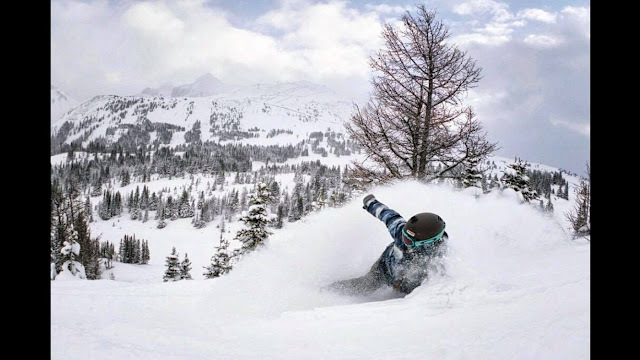 Originally from Taiwan, Sue now lives in Banff and is an ardent snowboarder: “The mountains are the canvas where we can make beautiful lines, our boards and skis are the paintbrush, and we leave our own signature,” she declares poetically on her Ambassador bio. 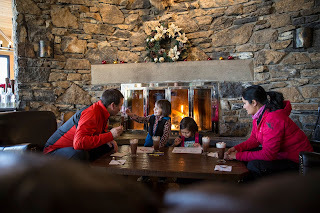 A fount of info on food, she recommends the crepes for breakfast at Java Lift, which is at the bottom of the Sunshine Mountain Lodge, conveniently by Standish Chair – go there for coffee stops, too. 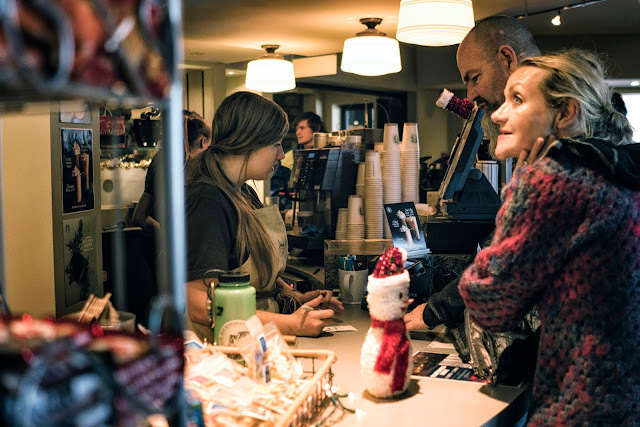 We always do and our friends, arriving before us, once bumped into Alec Baldwin there and had a great coffee convo – he’d gone before we got there, though! “ You can also make it a ‘grown-up’ coffee,” Sue suggests. 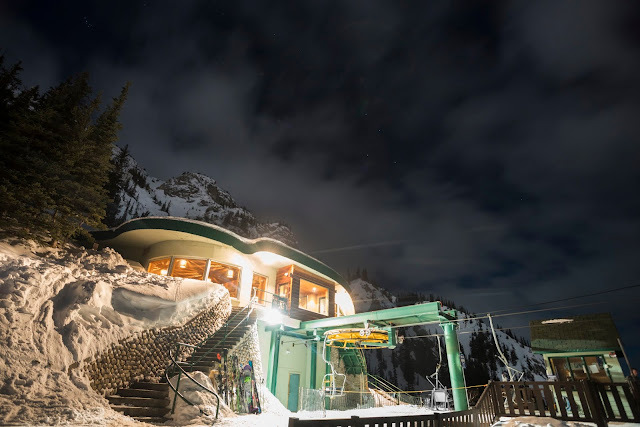 “This place is licensed.” For lunch linger at the Lounge atop the Sunshine’s Lookout Lodge: “Good variety of food with a great view,” says Sue. And, of course, après at Mad Trapper’s. “Fire place, rustic wood cabin makes a great place to brag about your day,” says Sue. Her dinner pick for topnotch cuisine is Eagle’s Nest at the Sunshine Mountain Lodge - but only after a pre-dinner dunk in the hot tub for maximum relaxation. Overshadowed internationally by Lake Louise and Banff’s Sunshine Village, Banff Mt Norquay is nevertheless a sensational ski destination in itself with a long history and a fervent following among locals and tourists. 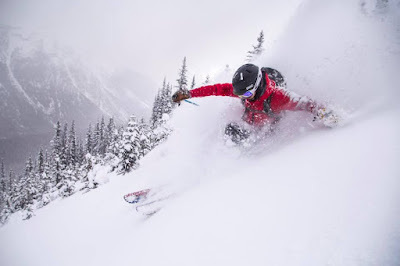 Visited in 1953 by Marilyn Monroe during the filming of River of No Return, it was the first ski resort in the Canadian Rockies, opening in 1926, so now notching up 93 winter seasons. 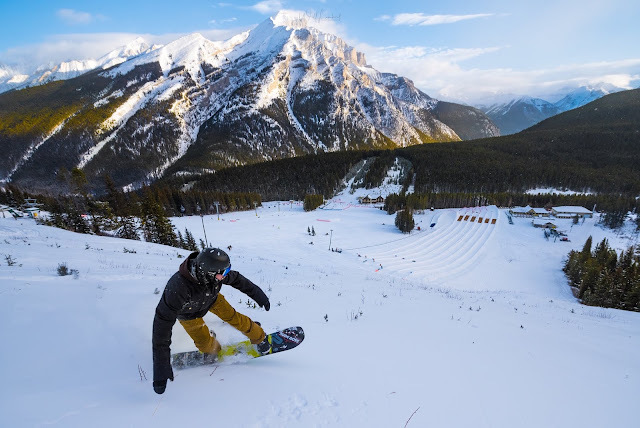 Part of the SkiBig3 pass and SkiBig 3 Guided Adventure tours, Mt Norquay is perfect for corduroy groomers, intense terrain park, family learning area view-able from the lovely lodge, and the jewel for downhill dare-devils: the Lone Pine. 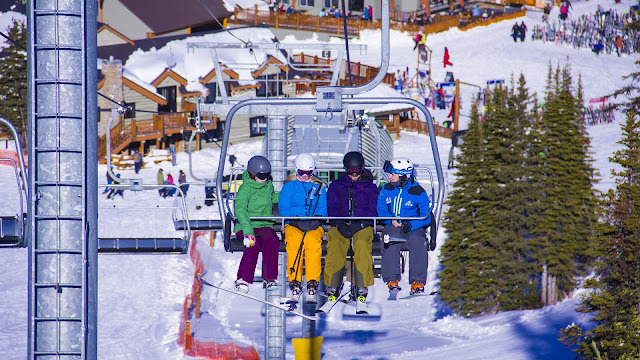 In this advanced area 26 runs are accessed by the experts-only North American chair. 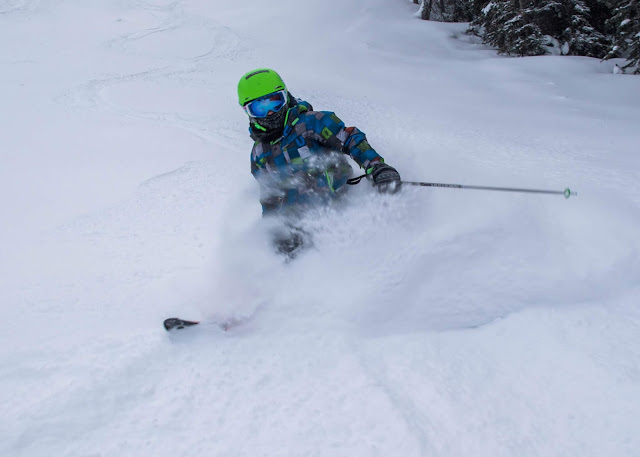 Rickety maybe, the ‘Big Chair’ is nevertheless the golden gateway to daunting double diamonds and blood-pumping blacks - a powder paradise on big snow days. This iconic two-seater lift reached its 70th anniversary this season - check out its rich history at: https://banffnorquay.com/norquay-70/. 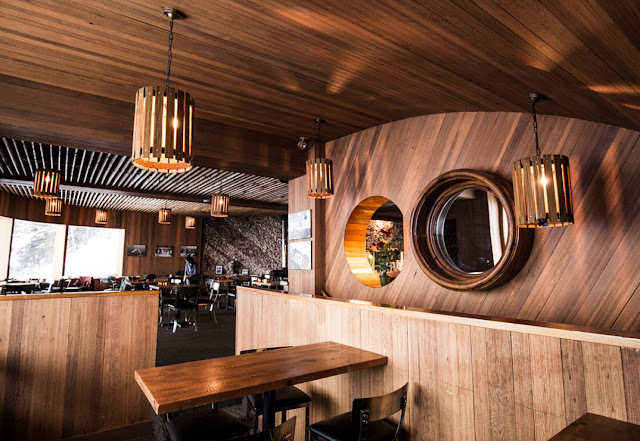 Another bonus from the Big Chair: the vintage Cliffhouse Bistro. At 6900ft, with panoramic views over Banff and the Bow Valley, you can stop here for coffee or lunch. This is the scene, too, for Starlight Dinner events in Feb and Mar, where intimate 50-seater wine-pairing dining is set up at this iconic 1950s teahouse with a singer/songwriter performance. Don’t worry, you don’t have to ski The Lone Pine pickled and in the dark - for these culinary experiences the lift downloads too! The Big Chair also takes you past an old ski jump which, like the outfits on Norquay’s 80s Day, looks like a leftover from a 1960s James Bond movie. 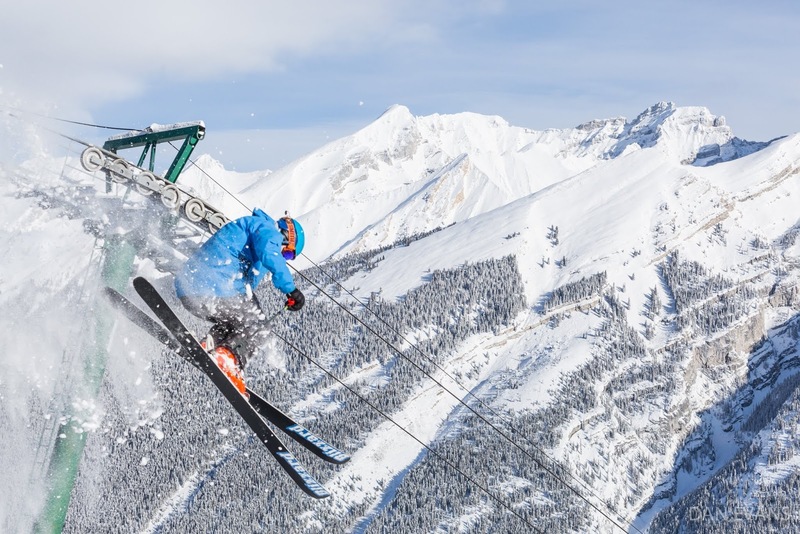 Having not skied Norquay for a while, I was interested to find out about all their innovations. The big news is new Banff-based ownership: the Waterous family through their financial holding company, Liricon Capital. And, with them comes a new master blueprint, notably including plans for a gondola from Banff to Mt Norquay. Step one, maybe: Adam and Jan Waterous have been given permission for a 493-stall park-and-ride lot at the Banff train station. This could also pioneer another project: passenger rail links with Calgary. Once per month Cool2Carpool Days are a new initiative at the ‘Quay’ (that's pronounced 'Kway' as in Nor-kway, BTW). 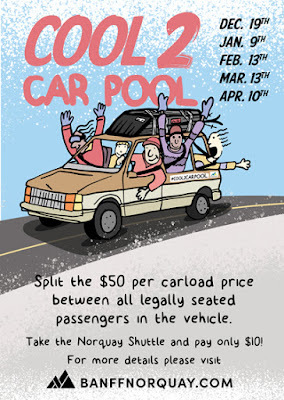 Ride-share cars pay $50 per carload to ski – so legally seated passengers split that cost. 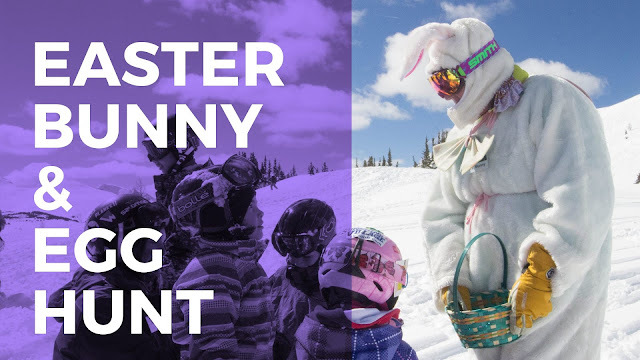 Shuttle passengers from Banff ski for $10 per person with $2 of that going to a montly local charity. This innovation replaces the too popular Toonie Days which led to overcrowded roads and carparks! 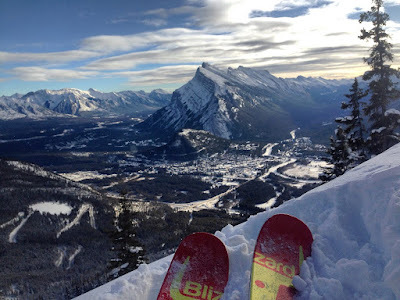 This was the first time I had skied Mt Norquay using the Mountain Collective multi-resort pass. 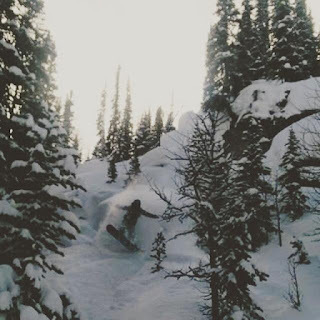 I had discovered that you get an extra free day at Mt Norquay as well as the usual two days at both Sunshine and Lake Louise. 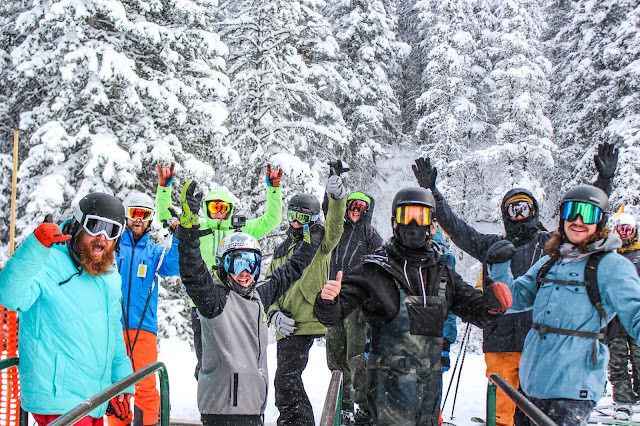 Because Mt Norquay is not an ‘official’ member of the 18-resort collective, you have to go into guest services to get them to print out a paper ticket rather than just going through the gate with your Mountain Collective pass. This season I’ll be using mine at Aspen and Alta as well as all three of the SkiBig3 resorts. 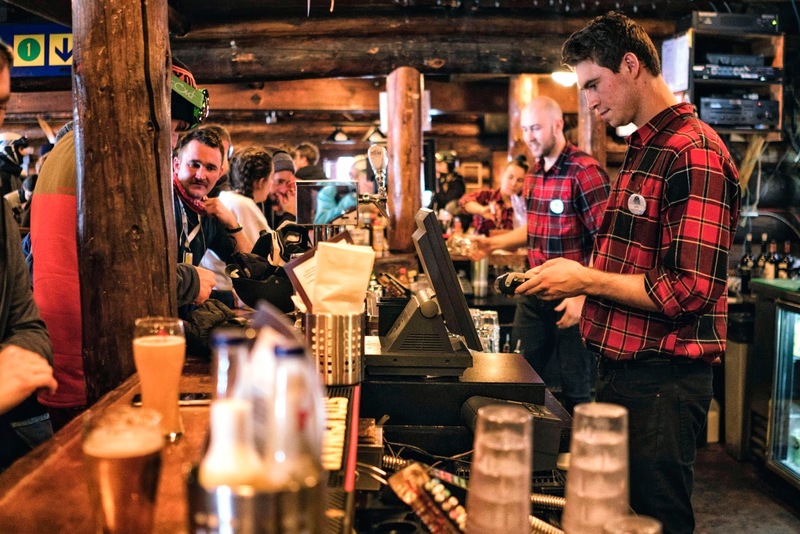 Always a hub for animated après, with weekend live music in the Lone Pine Pub, Mt Norquay has partnered with a local craft brewery to up the ante. Initially part of the resort's 90th anniversary, Banff Ave Brewing Co first produced the Norquay90 beer which has subsequently been reinvented with new versions each season. 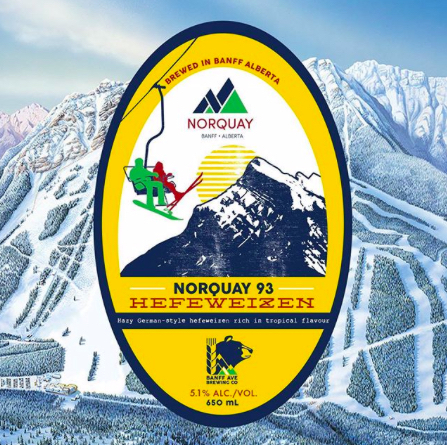 This winter’s, the Norquay93, is a German-style Hefeweizen. With our 26-year-old son, Rupert, in tow, we had a nostalgic Norquay day, reminiscing about his early days here with the Nancy Greene League. 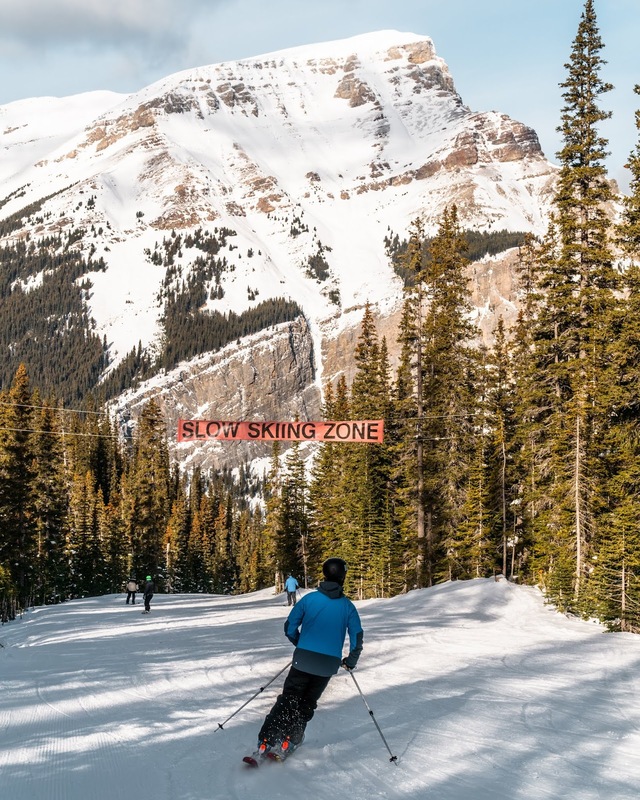 For our first five or six winters living in Canada, we took both our sons to Norquay every Saturday for this iconic ski race training program, giving them an early grounding in technique which has stood them in good stead on every kind of ski terrain ever since. 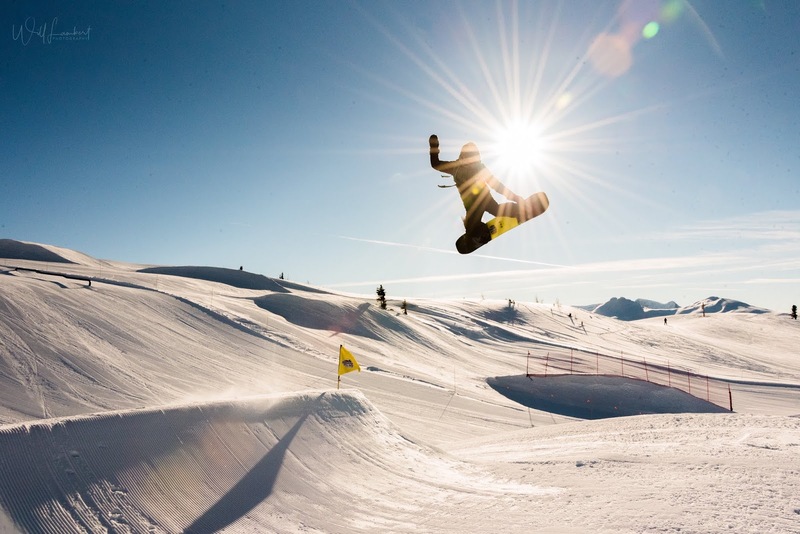 Visions of them going with their coach onto the North American for the first time will always haunt me, but I was eternally grateful that they were taken up there by professionals rather than leaving the daunting task of piste progression to me! 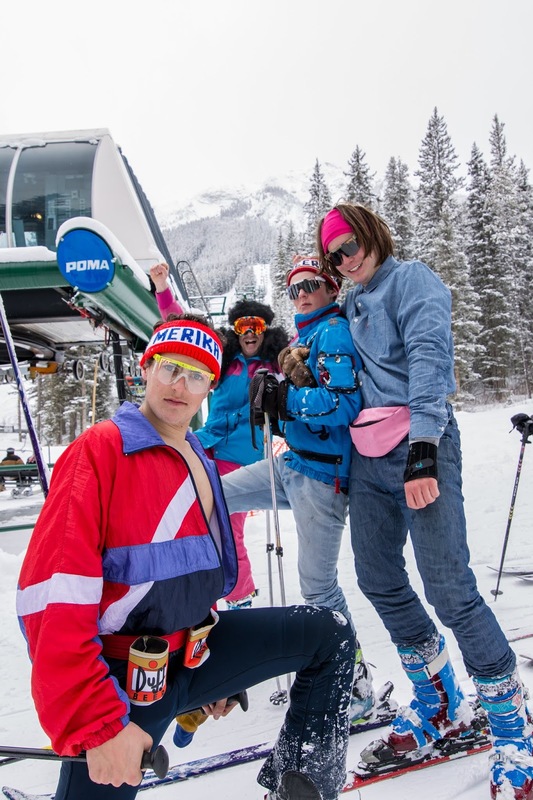 The Avalanche Club that they belonged to – and for which I was parent group ski and après organizer (now that’s my kind of PTA!) 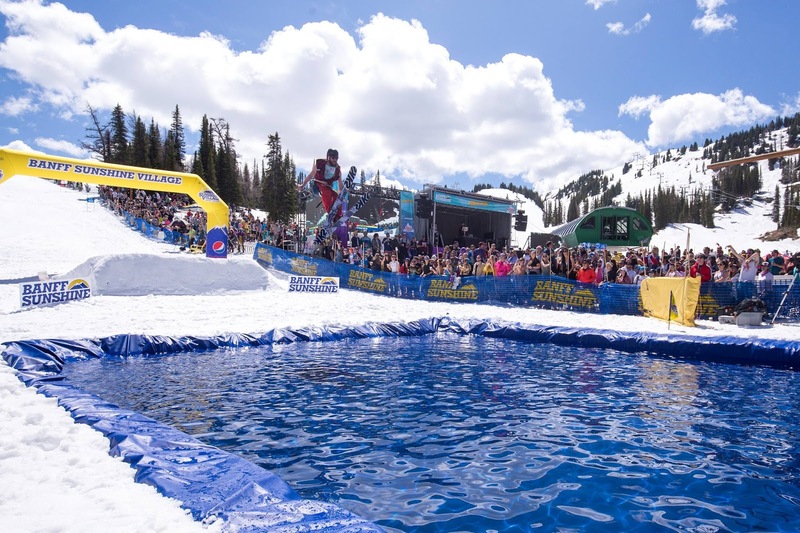 – no longer exists but there are multiple options for regular ski school, weekend camps for all ages and levels, and special holiday programs. 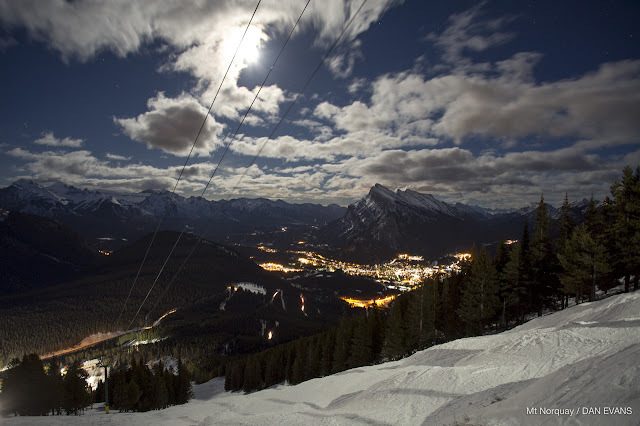 Banff isn’t the only town with quick access to Norquay. 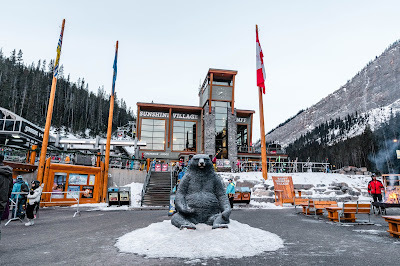 There’s neighbouring Canmore, just 15 mins outside Banff National Park, with lots of hotels, a vibrant Main Street with unique boutique shops and a range of restaurants, the iconic Rocky Mountain Bagel Co, and the Olympic Nordic Centre. This is the gorgeous mountain town where I was based during my ten years living in Canada and where I stay every time I return to visit what I consider my ‘home hills’. Because of this, I'd heard about Canmore Cave Tours and even included their Spirit of the Mountain underground Christmas concerts in my articles. I had never been on one of their tours, though, until this December. Lulled into a false sense of comfort-zone security by the thought of musicians being able to get into the caves manhandling massive instruments, I had no idea how far down they went or how narrow the tunnel to the amphitheatre and grotto would be. Even though I had bravely battled through the Cu-Chi Tunnels in Vietnam, I wasn’t prepared for donning overall onesies, a climbing harness with metal clips, and then using said clips to help me descend and ascend the equivalent of 16-storeys of tortuous, tiny tunnels. Little did I know that those clips and the ropes inside the Rat’s Nest Cave would turn out to be my best buddies. Luckily I’m small as there were some very tight spots, narrow ladders, and lots of crawling and scrambling over slippery rocks that apparently are being still dripped on by last April’s melt which takes that long to get down this far. I’d heeded the advice to wear sensible footwear – assuming that was primarily for the snowy half-hour hike up and down, and for warmth. I had no idea how flexible and grippy my Bos & Co après-ski boots would turn out to be! Anyone know how to get cave dust off suede boots? Fortunately the total darkness in the cave, illuminated just by our helmet headlamps, helped – because if I had been able to see more of the drop offs I would probably have refused at some point. A bit like the paradox of skiing a difficult run in a white out – I am less scared of the terrain because I can’t see it but hampered somewhat because of not being able to see! 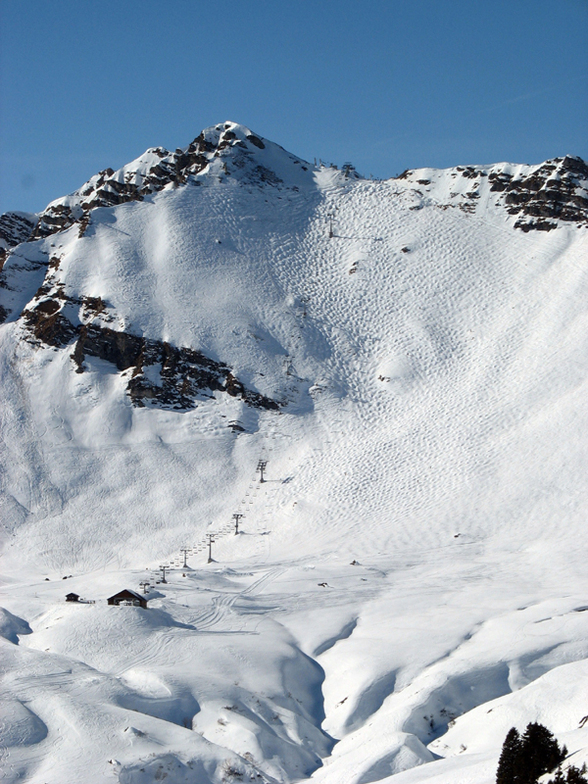 I once skied the Wall at Avoriaz in a white out (and masses of pow) and found it no problem. 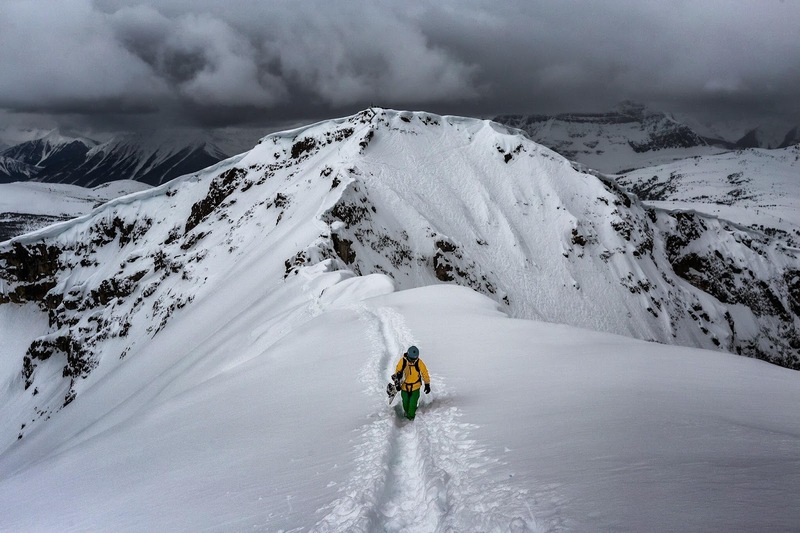 This is a run often listed in the world’s scariest runs. 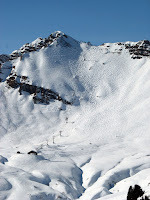 Sure enough, when I saw it from the chair on the bluebird day, I said never again!! Stuck between a rock and a hard place on Canmore Cave Tour! 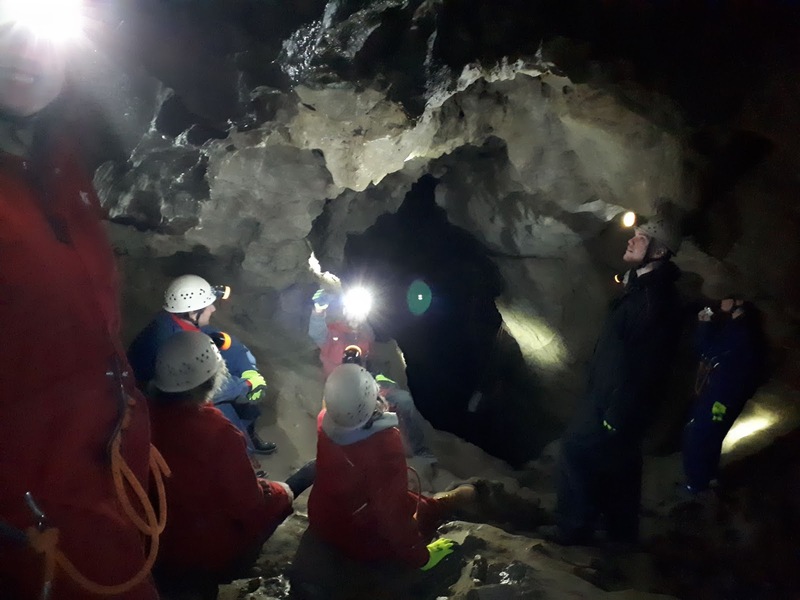 Back to the caves – it was a huge challenge with an equal sense of achievement (and massive relief) afterwards. I always get vertigo without my skis on, so I couldn’t believe I had managed it without too much embarrassment. I concluded that it was more intimidating than my first heli-skiing trip but without any advance apprehension as I thought it would just be a walk in the dark that musicians with cellos could manage – didn’t realize the musicians are all Canmore cavers for whom this is their regular playground. I was astonished at the younger gen on the tour, taking it all in their stride. One of them did say to me: “My mum’s about your age and she wouldn’t dare to do this” which helped – a bit. So, whether crazy or courageous, I’m really happy I did this but I don’t think I’m turning into a confirmed Canmore caver any time soon. My takeaway was this, though: I survived something that I would never have dreamt of doing and maybe that physical achievement will persuade me to do other things in the future that are seemingly beyond my power (although I’m definitely never scuba diving with sharks or skydiving, let’s get that straight). Our caring and conscientious guide told us that research has shown that testing ourselves really does help us to grow – our brains actually change with each challenge. Hopefully, this will have a practical application to skiing! Back on the hill, Mt Norquay was downright dazzling that December day. Brilliant azure skies, crisp corduroy, everyone in happy holiday humour. 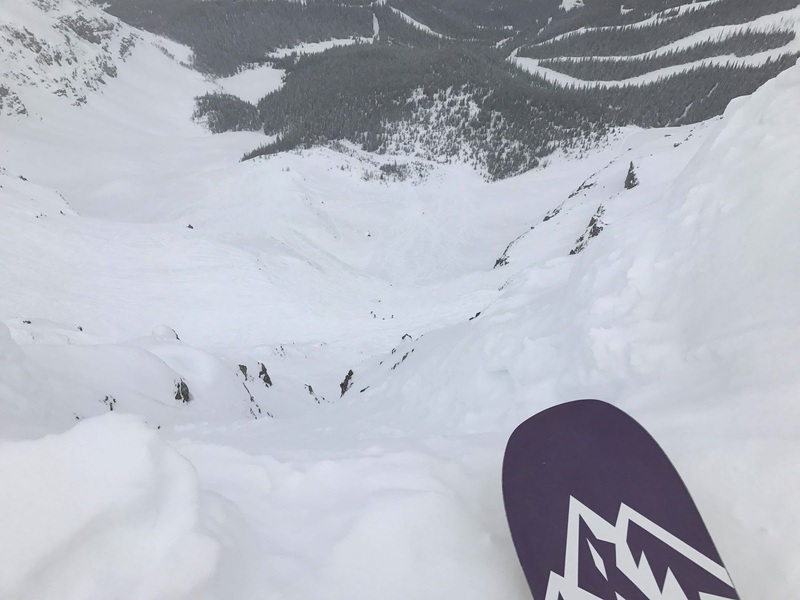 That’s my abiding memory of this hill: a fun family focus, something gritty for every standard, and always that possibility of getting powder perks with not too many people in competition. At the end of the ski day, my kids used to knock back a hurried hot chocolate and then rush straight back outside to scramble up the hill near Cascade Lodge to slide back down on their slippery ski suits. Meanwhile, we adults were getting our own form of adrenalin rush at the lively Lone Pine Pub. 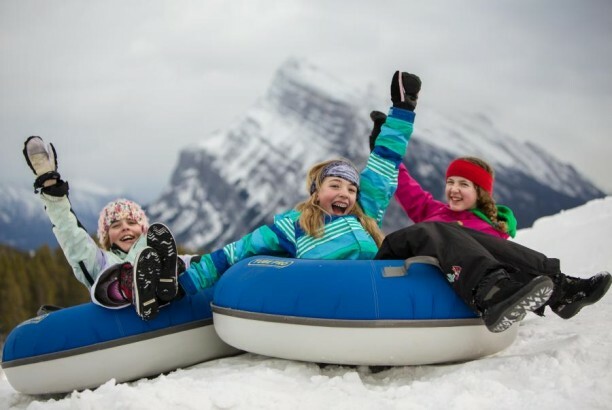 The sliding option has now been formalized into the huge Tube Town – actually Alberta’s largest tubing park with eight lanes and its own magic carpet.